Bestselling author Michael Lewis examines how a Nobel Prize–winning theory of the mind altered our perception of reality—now available at a great value! 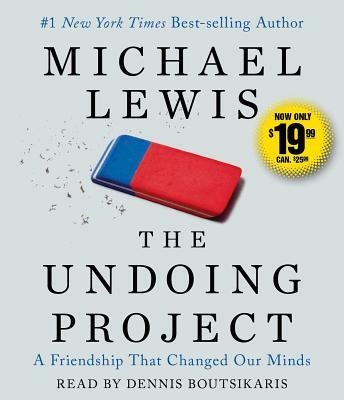 Forty years ago, Israeli psychologists Daniel Kahneman and Amos Tversky wrote a series of breathtakingly original studies undoing our assumptions about the decision-making process. Their papers showed the ways in which the human mind erred, systematically, when forced to make judgments about uncertain situations. Their work created the field of behavioral economics, revolutionized Big Data studies, advanced evidence-based medicine, led to a new approach to government regulation, and made much of Michael Lewis’s own work possible. Kahneman and Tversky are more responsible than anybody for the powerful trend to mistrust human intuition and defer to algorithms. The Undoing Project is about the fascinating collaboration between two men who have the dimensions of great literary figures. They became heroes in the university and on the battlefield—both had important careers in the Israeli military—and their research was deeply linked to their extraordinary life experiences. In the process they may well have changed, for good, mankind’s view of its own mind.